The traditional way to eat Cranachan was to spread bowls of the various ingredients on the table, with each person mixing their own Cranachan in their bowl, according to their personal taste, however today it is more commonly enjoyed layered in glasses, or even as a trifle. Scatter the oatmeal and the teaspoon of sugar over a baking tray, then toast in the oven for 10-15 minutes until lightly browned. Keep watching it as once it starts to brown, can burn quickly. Remove from oven and cool, breaking up any bits that have stuck together. Mash 2/3 of the raspberries, or if you prefer a smoother puree, push them through a sieve. Whip the cream until holding its shape, but not too stiff, then add the honey and whisky. Place the fruit, cream and oatmeal in layers in individual glasses, finishing with a layer of cream. 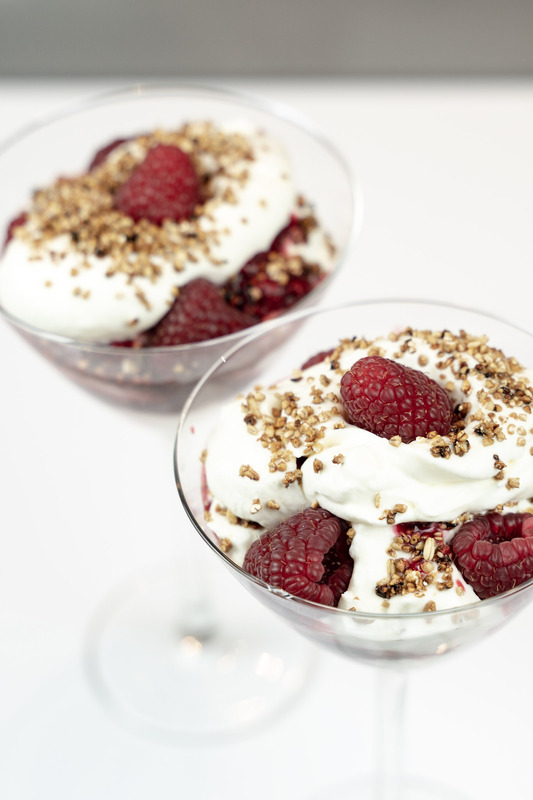 Decorate with a few whole raspberries and a sprinkling of toasted oatmeal. Can be served straight away or chilled for eating on the same day.